Kodak is set to announce new cameras at this week's IFA event in Berlin, but already details about the imminent releases have leaked onto the web. Three new EasyShare digital cameras are apparently to be shown: the Kodak EasyShare V1253, the Kodak EasyShare V1233 and the Kodak EasyShare Z812 IS, according to a report on Letsgodigital.org. 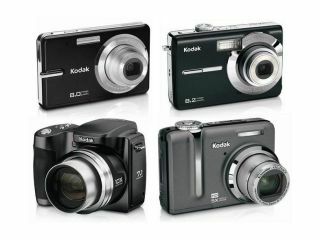 The 12-megapixel Kodak EasyShare V1253 looks the most interesting, being able to shoot video at resolutions up to 720p. It has a 5x optical zoom lens, and its sensor sensitivity goes up to ISO 3200, enabling flash-free shots in low-light environments. Other specifications include a 3.1-inch LCD screen, plus 32MB of internal memory supplemented by SD and SDHC cards. The Kodak EasyShare V1233 is pretty much identical to the Kodak EasyShare V1253, apart from a slightly smaller 2.5-inch screen. Finally, the Kodak EasyShare Z812 IS features an 8.2-megapixel CCD sensor and ISO 3200. Its 12x Schneider Kreuznach Variogon zoom lens doubles up as a 720p video recorder lens capable of shooting 30fps video recorder. There are also plenty of manual controls - which should appeal to the prosumer market - and built-in hardware image stabilisation, instead of the more common digital compensation. No prices or release dates have been disclosed, but we'll endeavour to find out later this week when we visit Kodak at IFA.